Staying positive. 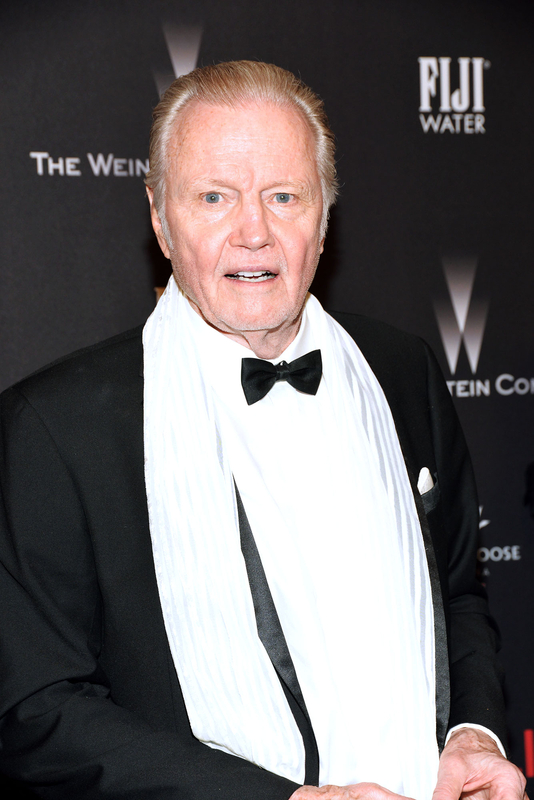 Angelina Jolie&apos;s father, Jon Voight, briefly spoke about his family following Brad Pitt&apos;s surprise appearance at the 2017 Golden Globes on Sunday, January 8. "Everybody is good," the Ray Donovan actor, 78, exclusively told Us Weekly at the Beverly Hilton hotel. Earlier in the night, a slim and handsome Pitt, 53, received a huge round of applause from the star-studded audience when he took the stage to present a segment about the drama Moonlight. Pitt, who was all smiles, particularly got a loud cheer from his former Ocean&apos;s Eleven costar Matt Damon. The Allied actor, of course, has been going through a messy split with Jolie, 41, since the actress filed for divorce in September after two years of marriage and nearly 12 years together. Last month, Pitt slammed Jolie in divorce papers for having "no self-regulating mechanism" and accused her of compromising their children&apos;s privacy. TMZ later reported that Jolie&apos;s lawyer Laura Wasser sealed the custody documents, but claimed that Pitt was "terrified that the public will learn the truth." Despite the drama, Pitt continues to have supervised visits with their kids — Maddox, 15, Pax, 13, Zahara, 11, Shiloh, 10, and 8-year-old twins Knox and Vivienne. As Us Weekly exclusively reported, he exchanged Christmas gifts with them over the holidays. "[Brad] gave them presents and it was cordial," an insider told Us, noting that Jolie was the one who organized the get-together.